Written By: Christine Carter, PH.D.
Narrated By: Christine Carter, PH.D. Learn how to achieve more by doing less! Live in that zone you’ve glimpsed but can’t seem to hold on to—the sweet spot where you have the greatest strength, but also the greatest ease. Not long ago, Christine Carter, a happiness expert at UC Berkeley’s Greater Good Science Center and a speaker, writer, and mother, found herself exasperated by the busyness of modern life: too many conflicting obligations and not enough time, energy, or patience to get everything done. She tried all the standard techniques—prioritizing, multitasking, delegating, even napping—but none really worked. Determined to create a less stressful life for herself—without giving up her hard-won career success or happiness at home—she road-tested every research-based tactic that promised to bring more ease into her life. Drawing on her vast knowledge of the latest research related to happiness, productivity, and elite performance, she followed every strategy that promised to give her more energy—or that could make her more efficient, creative, or intelligent. Complete with practical “easiest thing” tips for instant relief as well as stories from Carter’s own experience of putting The Sweet Spot into action, this timely and inspiring book will inoculate you against “The Overwhelm,” letting you in on the possibilities for joy and freedom that come when you stop trying to do everything right—and start doing the right things. 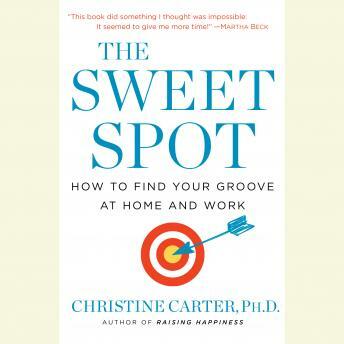 “Carter gives actionable ways to balance your life, your health, and your career. This book is packed with smart advice and hard-earned wisdom.”—Inc.